York is described in travel guides as a beautiful medieval city with Roman walls and a magnificent cathedral. My husband, Ken, and I planned to head north to Edinburgh from London stopping along the way at York. 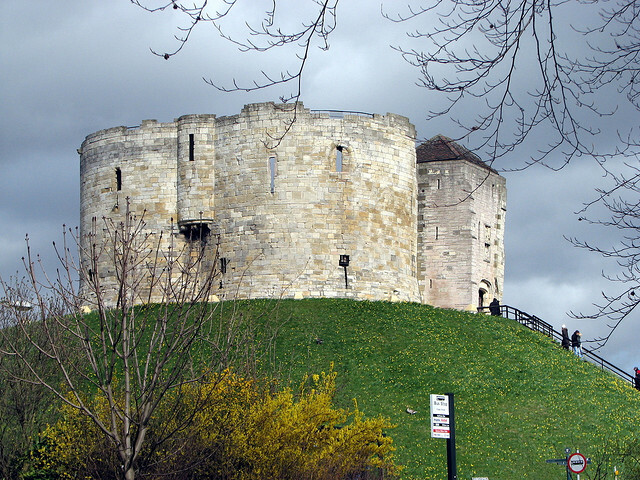 We didn’t know about the terrible history of the Jews of York whose lives ended in Clifford’s Tower in 1190. We had no idea that an electrifying experience awaited us, fortunately not comparable to the 1190 event, but one disturbing enough to stick in my head clamoring for attention. The Romans named York Eboracum. They arrived there in 306 CE. building their outpost over a former Viking fortress. They located their fort at the confluence of the River Ouse and the River Foss. The fortified mount provided a good vantage point to intercept Viking raiders who traveled up and down the rivers terrorizing villagers and looting fields and livestock. Seven hundred years later William the Conqueror arrived in York. He strengthened and expanded the same site building a stone castle in the Norman style. Remnants of the castle remain including a tower called Clifford’s Tower. Today the modern city of York has grown up outside the stone walls built by Roman soldiers. The old city inside the walls offers numerous medieval sites, including the ruins of St. Mary’s Abbey, and the second largest cathedral in Europe: York Minster. The town is also burdened with a terrifying history of the massacre of the Jews of York. My husband and I took the train from Chipping Campden in the Cotswold to York. We arrived and were delighted by the warm, sunny weather. Our small hotel was located inside the old city walls not far from the cathedral. The balance of that first day was spent settling in, and wandering around the old city searching for a place for an early dinner. Along the way we signed up for a walking tour of Roman York the next morning. The morning dawned cold, wet and windy but the guide did not cancel the walk. He looked like a casting director’s idea of a Ph.D. candidate whose thesis might be titled “Roman Breastworks of First-Century England.” He was wearing black jeans and a baggy green sweater with an ill-fitting black raincoat flapping around his knees. He was rotund with round, gold wire glasses perched on his beakish nose. He was well-spoken and chock o’ block with interesting historical facts. Our bedraggled group of 10 hustled along behind him seeking shelter from the wind-blown showers against old walls and under ancient arches. The guide had an umbrella; we had left ours behind in the room. Before long my thin coat was wet through and my sneakers soaked. We climbed to the top of the Roman walls and walked along the uneven stones surveying the old city below. Along the way the guide casually remarked that a tower visible in the distance was the site where the Jews were burned in 1190, concluding that at least the English didn’t round up their Jews like the Germans did. His comment about burning Jews in 1190 and refraining from rounding them up in the 1940s startled us. We didn’t comment on his remark. I suppose we were reluctant to reveal ourselves as being Jewish—a low profile seemed like a good plan. Our next stop took us back down to street level to view the functioning portcullis hanging over an arch leading into the inner city. The portcullis was designed as a first defense against invading troops. It was used to impale invaders when it was released by defenders stationed on the city walls. I looked at the huge oak grill with its lethal iron spikes looming over us and prayed the restraining ropes and pulley were set in locked position. After the tour concluded, we found a little café where we could eat lunch, dry off and warm up. Soup was being served and that’s just what we needed followed by a hot cup of tea. As we ate we pondered the guide’s off-handed remarks about the 1190 massacre of the York Jews. The first Jews came to England with William, the Conqueror in 1070 CE. About 100 years later there were about 150 Jews living in York. Jewish bankers had long served a useful function by lending money to kings and to commoners. In York, prominent aristocrats preparing to go on crusade frequently borrowed money from Jews to outfit themselves, their knights and footmen for the arduous trip to the Holy Land. The twin goals of many of the Crusaders were to vanquish the infidels and return Jerusalem to the Christians, and to clear Europe and the British Isles of as many Jews as possible who were, after all, Christ killers. A toxic combination came to a head in York on March 16, 1190, the eve of Palm Sunday, which happened to coincide with Shabbat HaGadol, the sabbath before Passover. Jew haters routinely told lurid tales about Jewish practice which included using the blood of Christian children to make matzoh, the so-called “Blood Libel.” The rumblings around York grew more and more threatening as Easter grew near. In the interest of safety, Jewish leaders decided to take their families up the hill to the castle fortress where they felt they would be safe. The castle was the King’s and the soldiers on duty should provide the small group of Jews protection from the mob. Several of the mob’s ring leaders were knights preparing for the upcoming crusade. Here was a chance to destroy all documentation pertaining to their debt. The documents were stored in town in the city archives. While the mob was busy burning the Jews—men, women and children–up at the castle, the knights burned the records of their debts to the Jews. An itinerant monk ranting outside the tower inflamed the mob with bloody tales of the Jews who were responsible for Jesus’ crucifixion. The townspeople set fire to the wooden tower with all the Jews inside. The York Jews knew the story of Masada, the fortress in the Judean desert built by King Herod in 31 BCE. In 73 CE, a group of Jews escaping from Roman soldiers holed up at Masada. Pursuing Romans eventually reached the gates of the fortress and entered the compound where they found all the Jews dead. They had committed suicide rather than being killed or sold into slavery by the Roman soldiers. The Jews in Clifford’s Tower came to the same desperate decision. Most committed suicide. Some who tried to escape were slaughtered by the mob. There were no survivors. In 1978 a memorial tablet was placed at the base of Clifford’s Tower, which is now an English Heritage site. In 1990, a ceremony was held to commemorate the 800th anniversary of the massacre. After dealing with these grim stories, we were ready for something that was peaceful and soothing. We decided to attend Evensong services at York Minster. The choir and organist would perform; it was a short service with no sermons. It would be lovely to sit in the spectacular Gothic building as the lowering sun lit up the magnificent medieval stained glass. York Minster is one of the largest churches in northern Europe. Its archbishop is the second highest official in the Church of England. The windows in the nave date to 1338 and are the largest expanse of medieval glass in the world. The church, built on an early Christian church site which was built above a Roman temple, was begun in 1230 and completed in 1472. Like most historic sites it needs constant restoration and cleaning. Even with one side shrouded in the ubiquitous green screen used during restoration, the gothic spires and golden stone of the cathedral are magical. If you arrive early for the Evensong service you can be seated in the exquisite Kings’ Screen choir stalls intricately carved with the figures of the English kings from William I, to Henry VI. These statues are replicas of the original 15th-century sculptures which were destroyed by a fire in the 19th century. The organ is situated above the choir, surrounding you with beautiful voices and music from the magnificent organ. The stone, marble, and glass of the cathedral hold the music until it fills the vast room. Sitting there you can imagine the parade of religious leaders, kings, queens, nobles, serfs, craftsmen and commoners who have enjoyed a similar experience for centuries. The first song concluded and a priest in the vestments of the Church of England walked to the podium to read a passage from the Old Testament. Another song was followed by a responsive reading. Then a second priest came to the podium to read from the New Testament. She read from the Gospel of John 19:1-16. Scholars believe that the gospel of John was written by early Jewish-Christians sometime around late 200 CE. This period was a time of great tension among the followers of Jesus who lived and worshiped in the Jewish community and Christians who had left Judaism to form an independent community. Over time the Christians and Jews became enemies as the basic tenets of the two groups remained incompatible. Being aware of the gospel writers’ political background provides insight into John’s portrayal of the Jews as enemies of Jesus. John was a member of the Jewish community and was personally caught up in the struggle between Jew and Christian. He may very well have seen the religious leaders of the Jewish community as intransigent and rigid, which is how he portrays the Sadducees and Pharisees in the gospel attributed to him. According to John, Pilate was willing to release Jesus to the Jews in honor of the Passover celebration. This is highly unlikely. Jews did not have the power or the right to condemn or crucify anyone–only the Romans could do that. John goes on to suggest that the Jewish priests preferred to have a known rebel –Bar Abbas–released instead of Jesus. To say you are “King of the Jews” was an act of sedition. It was politically expedient for the Jewish leadership to declare they held no one in higher esteem than Caesar. Charges of sedition routinely led to the crucifixion of hundreds if not thousands of Jews with terrible regularity. She continued in the same flat voice to read from John. The priest folded her book and walked back to her chair. In the stillness of the vast room her words fell like blows sending me reeling back in time. I could have been locked in Clifford’s Tower listening to the rant of the monk on the steps. How many thousands of Jews have been tortured and killed because these words have been and are still being read to Christians over and over again. I was first stunned and then enraged. How could a religious leader living in 2013 read this passage without setting it in historical context? The service ended with the Lord’s Prayer, communion and a hymn. Ken and I sat in stunned silence. People stood and filed out of the choir stalls and left the cathedral. As we walked outside, I saw the two priests chatting with congregants and tourists. I wanted to talk to the priest who had read the passage from John. I was so intensely angry it was hard for me to control my voice but I knew that I had to speak to her calmly and respectfully. She stood like a wooden statue. No smile, no acknowledgment of my anger and hurt. What she did say was, “We are required to read every word of the old and new testaments. This verse is part of our rotation, and it is part of our doctrine. We do have an annual multi-faith service where we welcome members of other faiths.” She concluded, “This is the Church of England, not the United States.” She turned and walked away. I felt as though I had been slapped. We crossed the green lawn surrounding the cathedral and walked back to our hotel in the dimming light. We have discussed this experience many times. We know that anti-Semitism is on the rise around the world. Having it served up to you in a place where Jews were burned alive horrified us. Neither of us has forgotten this experience. It is the most troubling event of our trip. I remain troubled. This occurred in a major institution in a country noted for civility and good sense. However, this institution persists in hallowing words that can and do incite people to violent acts against Jews. If not violent acts, at the least these passages provide the emotional framework for anti-Semitic belief. In the United States, the Episcopal Church (the American off-shoot of the Church of England) has a reputation for embracing change and accepting people of varied lifestyles. They do, however, follow the same practice of reading the Gospels word for word. The Christian church of the 21st century appears as mired in hate speech as the church of the 4th century and beyond. There have been attempts by various churches to “forgive” the Jews for killing Christ, but these efforts miss the mark. Passages like those from John contain venomous language which bears no resemblance to the message that Jesus preached. The disciples’ writings have set the stage for anti-Semitism down the ages. Their modern followers have a chance to end this long-standing, mistaken, and hateful tradition. I hope they will. Alberta Weinberg was a school teacher, served as Regional Director of B’nai B’rith Youth Organization in the Pacific Northwest, has written several articles for Seattle-area publications and Moment; she blogs, assists training dogs for persons with physical disabilities and is writing a memoir. Good writing, and a riveting story. I read every word. Probably a good thing that British are abandoning Christianity by the droves. The Anglicans are just holdouts from medieval times. What a shameful, horrendous chapter in British history! And a lesson in how Anti-Semitism gets handed down from generation to generation among Christians. Thank you for publishing it. My friend Alberta gets it right on the nose! 800 years from now, when the Jews still remember the massacre at York, will anyone else remember the Shoah? Or will they produce more of this kind of behavior? The Sephardic service still commemorates the massacre of the York Jews in their service, every Yom Kippure. The Romans arrived in 70AD, 800 years before the Vikings. Thank you for your careful reading. You are correct. I did find that there were Roman incursions in 55 BCE, 43 BCE and finally the establishment of the fort at York in 71 CE. I would also like to correct an error, scholarship indicates that The Gospel of John was compiled in the late 1st Century CE not the late 2nd. You failed to speak out against your guide. You failed to speak out in the moment against the priest. You call yourself a BBYO leader?! Ah, yes, the British. The ones who played India’s Hindus against its Muslims harkening today’s Pakistan and its paranoia about everything Indian. The ones who with the French created today’s Middle Eastern nation states with no regard for the tribal imbalances this caused. The ones who played Palestine’s Jews against its Muslims helping forge today’s Israeli-Palestinian standoff. The British, so civilized and mannerly. The British who at least twice in their history expelled their Jews. Am I surprised at the author’s experience in York? Not in the least. But, Britain is paying a price for its perfidy. The country is being taken over by its Muslims. Its empire is a footnote in history. Oh,perfidious Albion!Here in South Africa nearly all the anti-semitism and Jew-hatred emanated from the British imperialists and colonialists – not from the Blacks or the other indigenous peoples,nor from the Calvinist Afrikaners (descendents of the original Dutch settlers).The British with their exclusive cricket and country clubs – no Jews allowed here, please. Oh yes,perfect gentlemen;such civility! But beware – their hearts are filled with loathing and hatred of all things “Jew”.The malignant events the tourists experienced in York come as no surprise to someone living amongst Englishmen and women. The more things change, the more it remains the same. Good morning. You finally woke up. Thank you for starting to wake others up, even if they refuse to listen. Thanks to all for the inspiring and informative comments to my blog! My late wife and i had a wonderful few days in YORK.We were told all the stories of what happened to the jewish people in 1190.but no one seems to give the direct answer.Which is ,did the jewish people force JESUS WITH THE CROSS to be crucified and to find the truth HOW did they get the blame.AND WHY..